I love the combination of exotic and whimsical. Who says Rajasthani-chic needs to be oversized gold earrings and an Hermes wrap? Anthropologie keeps the sultry gypsy in check with this adorable bedazzled elephant. 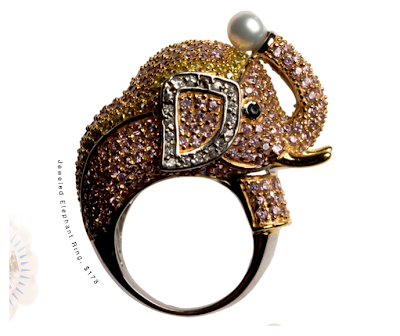 i've been seeing jewel-encrusted animal rings just about everywhere and i think i might need this one!